Gilbert Stephens Solicitors are pleased to be taking further steps towards becoming a Plastic Free firm by reducing our use of disposable plastics. 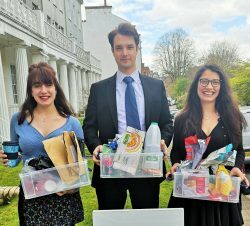 Antonia D’Alessio, Graduate Legal Executive and Sarah Heath, Chartered Legal Executive at Gilbert Stephens, recently attended an event run by Plastic Free Exeter, an initiative that aims to make Exeter plastic free by 2020. Antonia and Sarah have taken up the challenge of becoming Gilbert Stephens’ Sustainability Officers and will be trialling Plastic Free Exeter’s recommendations in our Exeter branch for 2 months before expanding these eco-friendly practices across our 6 branches. Plastic Free Exeter intends to achieve its aim of becoming one of the first plastic free cities in the UK by working with the council on a strategic approach to this issue, guided by the campaign’s steering group. For success, it is vital to engage businesses, schools and communities to take positive action and change the habits that are causing the problems. You can even help a charity at the same time; Ellie’s Fund is a children’s cancer charity that can raise money from used plastic that you send them. Disposable coffee and water containers are responsible for a lot of plastic waste. Consider investing in your own reusable coffee cup or drinks container. Do you really need to use them? Reach for a glass instead! We all know about using as little paper as possible. As well as printing only when necessary, you can also remember to print ‘double-sided’ and use a font that uses less ink – for example Calibri. At Gilbert Stephens, we are committed to continuing improvement in every area. Whether its client care, HR or our environmental impact. We look forward to seeing how our new Sustainability Officers get on with this initiative, and to finding new ways to help Exeter become plastic free while showing that you don’t need to pollute the environment in the course of running a business. If you would like any more information about how you can help, as an individual or a firm, you can follow Plastic Free Exeter on social media @plasticfreeexeter or take a look at their website.